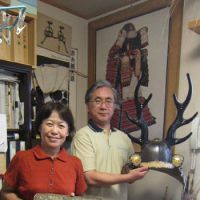 Chizuru, 58, and Fumio Nishioka, 59, are samurai-armor restorers. Among the handful of such specialists in Japan, they are the only ones who use the same techniques as artisans historically did in the past. Whether 900 or 150 years old, a samurai’s armor reveals its history through its layers of skilled craftsmanship. Chizuru and Fumio carefully restore such masterpieces to their original glory. Chizuru is the only person in Japan who still uses the ancient art of Japanese loop braiding, a technique to create intricate silk threads that was common after the eighth century to hold together and decorate armor. Fumio is a master at many art forms related to the armor: steel-, silver- and gold-work; lacquer and leatherwork. The two are mesmerized by the art and spirit of Bushido and live very much like samurai: disciplined and ready to “die” anytime — after a good day’s work of course. Fumio: Yoroi samurai armor showcases the best of Japanese craftsmanship and is a great example of our monozukuri (art of making things) culture. It was created with the most advanced technology of its time — from the steel of the helmet to the thin, lightweight yet strong leather for its breastplate that no sword or arrow could penetrate. Japanese armor is flexible as it is sewn together to fit the body with silk cords. It’s always custom-made for a perfect fit that allows the wearer to make quick moves. It’s also lightweight, so even the horses the samurai rode didn’t suffer much: An entire suit of armor can weigh 5 kg to 25 kg. 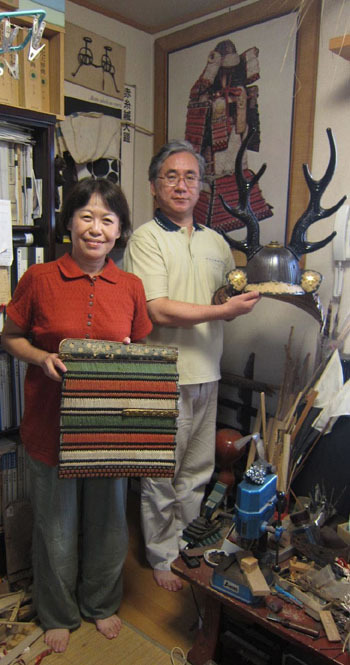 Chizuru: Artisans are the threads that connect the past to today. When I first began examining the antique braids, I realized that they were created from 144 individual silk threads. A hundred and forty-four — can you imagine that? I was stunned and intrigued. They look simple, yet they are made of many individual strands of beautifully colored silk, all intricately woven together. Fantastic, I thought! Colors, of course, fade, but they have held up well to the wear and tear of time and are still visible on armor that was made more than 1,000 years ago. The silk was dyed using plants, and I follow those techniques. Of course, I had to make my own weaving loom, too. A small braid takes me two months to finish. F: Japan is known for natural disasters, so keeping a replica comes handy. We enjoy researching materials and creating replicas for future generations. Restorers usually preserve an antique against further deterioration, but we also do something else: we analyze an object and how it was made, and then recreate each material and technique to the best of our knowledge. We make complete replicas that not only look like the armor did centuries ago but are also made using the techniques of the past. That is our passion: to preserve and to recreate. C: Unless the Japanese government creates a national strategy to support craftspeople, our generation might be the last one to keep the traditional arts alive. We can’t find anyone to study with us and our friends, all artisans, are all struggling alone. Young people don’t study Japanese arts because they know they can’t make a living from it. F: Japanese craftspeople are all possessed by their love for the art, so making money is not on their minds. As long as we survive, we are happy. But as of now, even making enough to eat and live is hard for many artisans. We are lucky as we are in this together. C: The process of how something was made provides a peek into history. Maybe for some it seems silly to reproduce something according to the exact way it was made in ancient times. But for us, this is our lives’ work. We think that we can understand people and their — our — history by following, step by step, the way they created objects. F: Japanese have always been very individualistic. Look at the kimono: every woman has a different design, no two patterns are identical. Same with samurai armor. Each helmet was decorated to express the wearer’s uniqueness. The foot soldiers wore similar, simpler, armor but once they got promoted or had some extra cash, they added some individual ornaments to their armor. C: When education is compromised, we lose our national treasures. No Japanese university has a department dedicated to the study of the samurai, and, of course, no school has a major in the restoration of samurai armor. We learned all we know from other craftspeople, books and from examining armor. Only a few people research samurai, and many only do it as a hobby as they can’t get jobs that way. F: It’s just as important how we die, as how we live. For a samurai’s family, survival depended on if he was brave and died like a man. Dying with dignity and pride was a samurai’s mission, and for his group it was the highest compliment. His family would live on according to how he died: If he went out as a hero, his family would be respected and would survive. If not, they would be finished, too. C: One small flower in a room changes the atmosphere. It sits there looking pretty and peaceful and it creates beauty for people. Imagine the difference a person can make.